Piazza Navona is a long oval square in the historic center of Rome. In the year 86AD, here was the Stadium of Domitian with sport competitions and great chariot races. It was 54 meter width, 276 meter long and had a capacity of 30.000 spectators. The Piazza has 3 beautiful fountains but the one in the centre is the most spectacular. 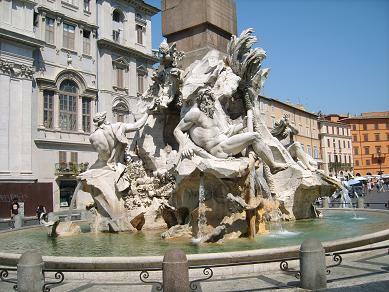 It is Bernini’s Fountain of the Four Rivers (the Ganges, Danube, della Plata, and Nile), erected in 1651. On the square are restaurants with terraces and icecream shops. 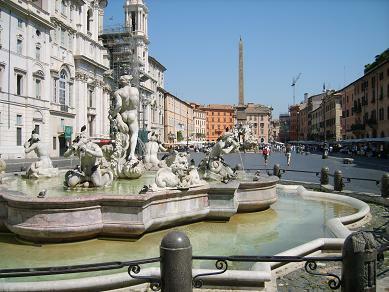 Piazza Navona is close to a main street (Corso V. Emanuele II) and about 10 minutes walking from the Pantheon. Metro station ‘Colosseo’ (line B) is nearby. Navona Palace Residenze Di Charme is housed in a 17th-century building less than 155 meters from Piazza Navona. The accommodation has Double Rooms and spacious Suites with sitting area. A beauty treatment in the hotel spa is included for 1 guest.